I’ve written quite a bit about life in Brazzaville mainly because more funny and bizarre things seem to happen when people live on top of each other. But I fear I’ve given the impression that I never leave the city when in fact I’ve been lucky to have the chance to get out into the bush quite a bit. In an effort to get one of my blog posts picked up by BBC travel I’m going to tell you all about one of my favourite spots. You’ll have to forgive the ‘what I did in my Easter holidays’ style of this post and if you get bored you can just look at the pictures. 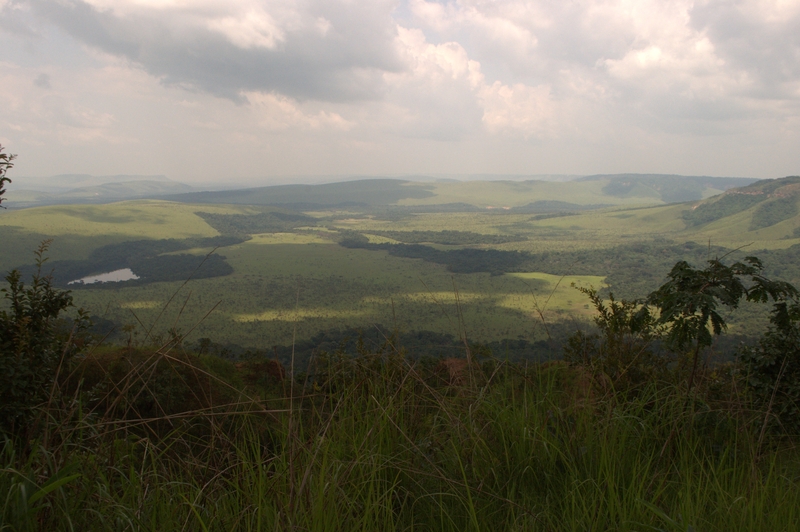 Lac bleu – or the blue lake – is about a three hour drive from Brazzaville and deep within the Lefini reserve. Once upon a time, the reserve hosted a huge variety of animals – gorillas, boars, elephants, buffalos, and antilope could all be seen frolicking across the plains. But a combination of war and a growing population with a taste for bushmeat has devastated the animal population in the reserve. It’s a familiar story. 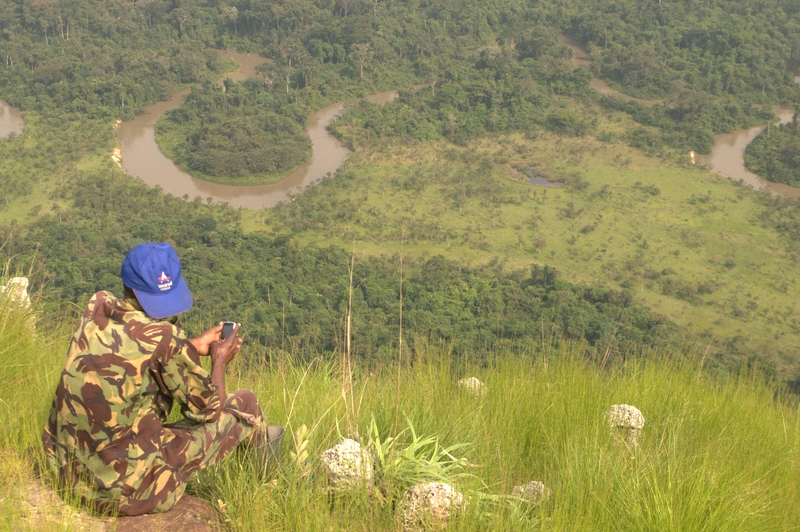 One day, an Englishmen with a gambling background decided to set up a gorilla sanctuary between the Lesio and Louna rivers and the organisation now runs two main sites in the reserve where tourists can visit, go for a hike or a river ride and, in the case of Iboubikro, stay the night. 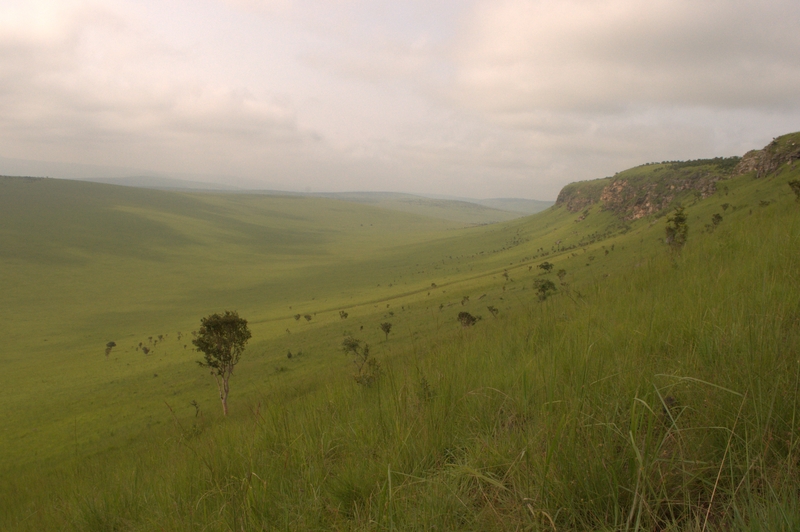 The first time I went to Iboubikro was just after my arrival and it was my first real glimpse of the astoundingly fertile terrain that surrounds the city. You emerge from the heat and dust of Brazzaville into the most fabulous green landscape that, I’m gonna be honest, reminded me of Wales. Rolling hills, fluffy clouds, imminent rain. But you won’t have a hope in hell of coming across a Spar. In yet another example of Africa’s uncanny ability to make me feel like I’m standing on the edge of a mighty abyss, there was indeed nothing to interrupt the natural landscape for many many many hundreds of miles. So I treated myself to a romantic moment imagining the elephants yomping happily about the savannah disturbed only by naughty monkeys, but it very rapidly degenerated into a scene from the Lion King. Not helped by Guillaume playing the French version of the film’s soundtrack on the car stereo. 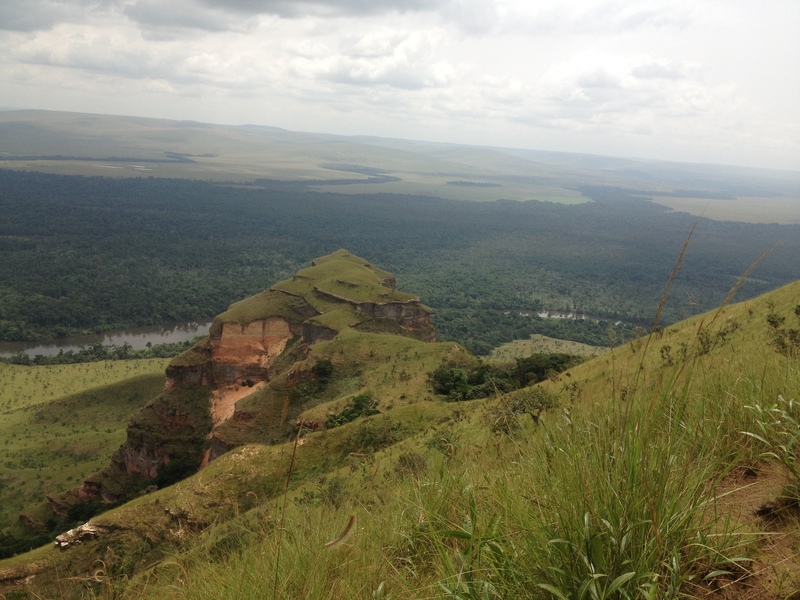 The elephants are gone, but according to the bio-guards who now defend the site from poachers and French tourists determined to connect with the spirit world, there are still some boars and antilope and the tracks in the bush suggest the buffalo have returned. 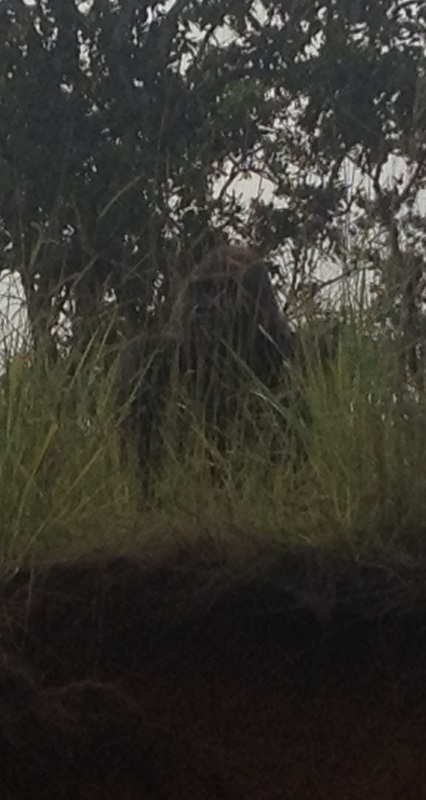 But the real stars are the baby gorillas living temporarily in the Iboubikro site before they are released back into the community of wild gorillas living in the reserve. These are gorillas who have been stolen by poachers, whose parents have been killed for bushmeat or who have been born in captivity as pets, but subsequently rescued and brought to the site where they are allowed free reign during the day and sleep in a cage at night. 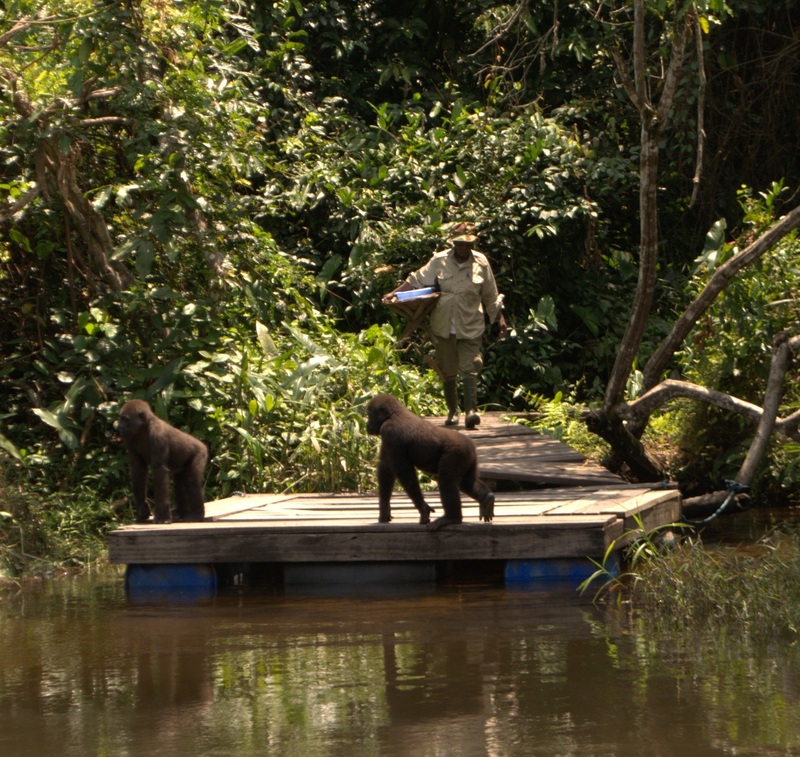 At the appropriate age they are taken to another part of the reserve where they are reintroduced to the wild. Visiting baby gorillas in a semi-captive state won’t be everyone’s cup of tea, and there is something a little uncomfortable about the manner in which they are brought to the platform on the other side of the river as if to perform for you. But they are damn cute, and I have no problem supporting a project that has endured for a good cause, in a complicated country through the application of pragmatism and inventiveness. 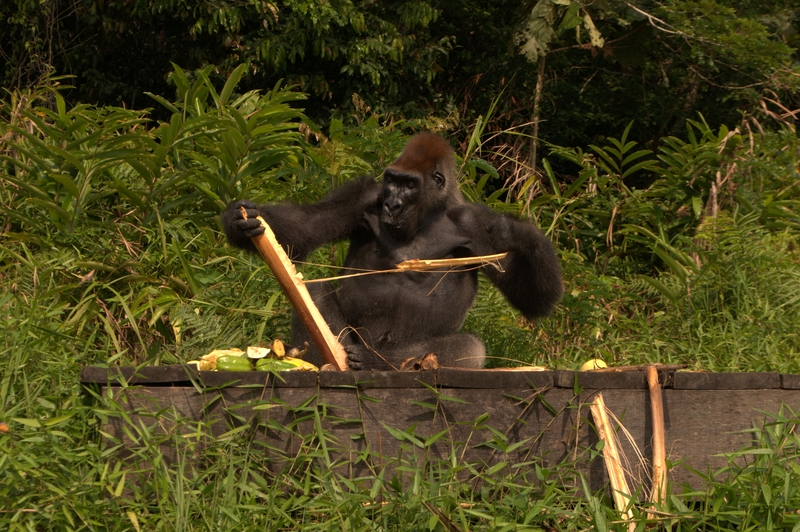 The project managed to survive Congo’s civil war in 1997 by evacuating the gorillas by helicopter away from the encroaching rebels to a site in Pointe Noire. On a subsequent visit to the other project site, Abio, we had the ridiculous good-fortune of getting to see a couple of adult males who have been reintroduced into the wild. The first was Sid – a poor ancient fellow whose decrepit state of health meant he couldn’t really hack it in the wild so was moved onto his own little island. He’s brought out onto a platform to enjoy his lunch of fruit and veg while being shamelessly gawped at and photographed. I don’t blame him for tossing half an avocado at us. During a river ride that I would classify quite easily as the most wonderful thing I have experienced in Congo, we sped along the narrow waterways through the dense jungle. At one point we stopped to briefly watch a female hippopotamus with her young but scarpered before the male turned up. On our way back to camp the guard heard a rustling in the bush and pulled the boat up to the bank. Hiding amongst the tall grass was an adult male looking down onto the river. Hewas a great mass of black hair topped with a slightly orange crown. His muscles bulged and strained as he pounded up and down the river bank, making an enormous noise as his great weight thudded on the ground after each leap. He paused a moment, opened his mouth wide to reveal a row of vicious-looking teeth, and thumped his fists against his chest. My Jungle Book moment. Having pulled on your heart strings with my monkey stories I’ll now return to the point of this blog – my visit to the blue lake. 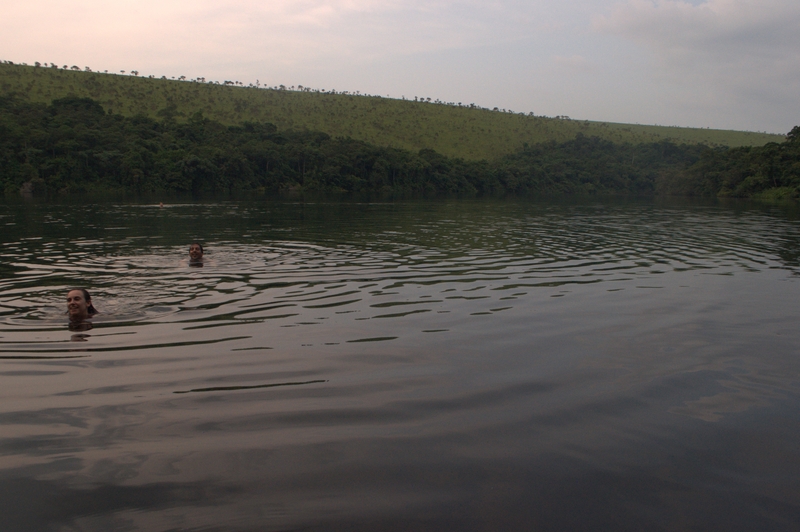 The lake is a short drive from the Iboubikro site and is idyllic. It’s surrounded by forest and perfectly quiet, so you can swim about to your heart’s content with only the fear of slippery beasties to disturb you. There’s a paillote – a little strawtopped hut – where you can eat a picnic and enjoy the endless hills and cloudless sky. It’s the perfect end to a weekend spent sweating and panting up steep slopes, or delightfully thrashing the French at petanque. Wow! that’s Amazing, I go to Congo in october to discover my mother’s country origin and I want to experience other places than Brazzaville or Pointe Noire. 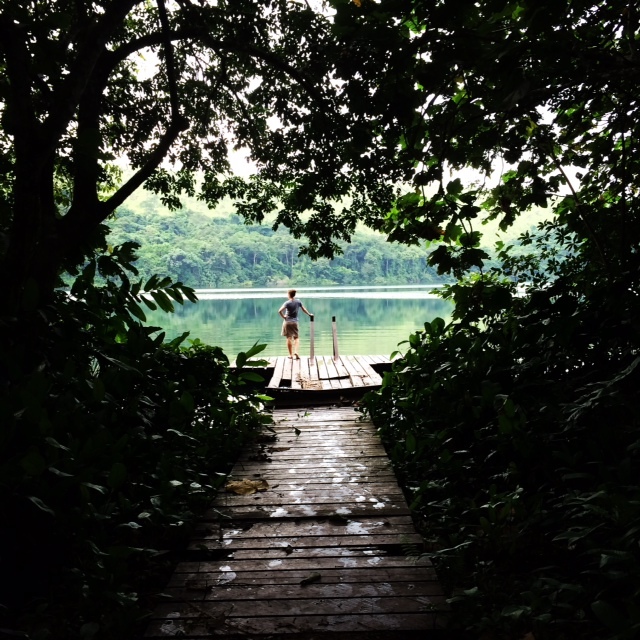 So glad to see there are paradise in Congo 😉 Great article!